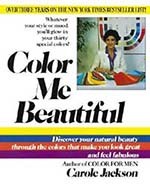 Color Me Beautiful has been printed more than 4 million times. The color rendition, especially of the models, is a bit less accurate as in the earlier editions. 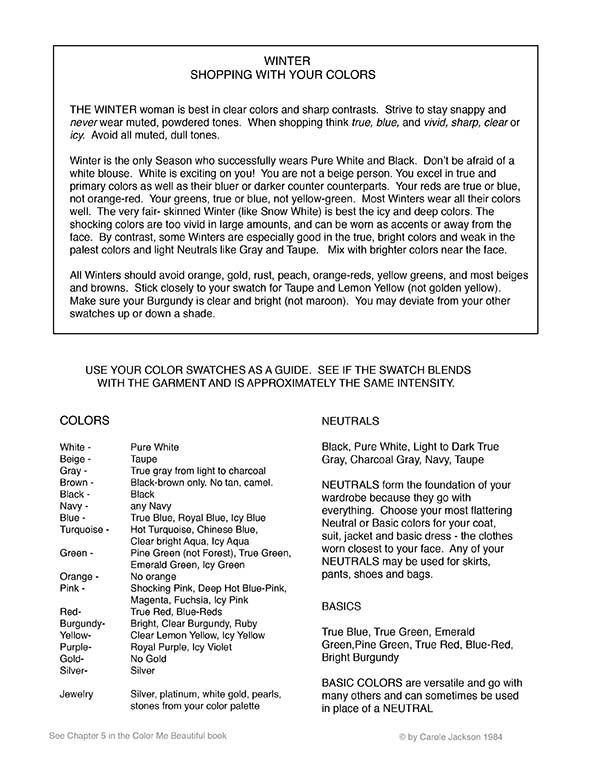 In 1981, the printing press required plates (black, blue, red and yellow – sometimes 6 plates) and color corrections were done by hand (called dot etching). Today we have computers to adjust colors and PDF files to transfer books from print to electronics. Some used books have the color pages torn out. Even library books had color pages removed by the reader who last checked out the book. 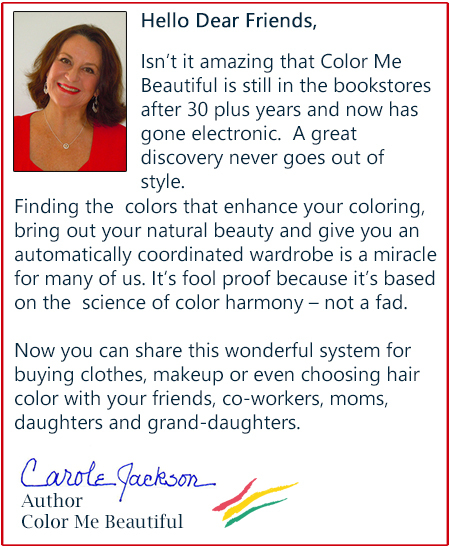 New books are still in print for Color Me Beautiful so you can be assured you will receive the color pages. 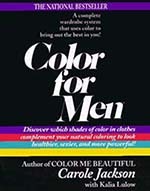 You will need to buy used books for Color For Men and the Color Me Beautiful Makeup Book. 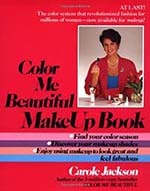 Beware: there is no hard cover of the Makeup Book, though it is offered on Amazon. The contact information in the back of most books is obsolete. The phone number belongs to an Exxon station in McLean, VA. (I am told that the person answering the phone “rudely hangs up” when asked if he sells color swatches. Poor man! I hope he doesn’t get 4 million calls!) 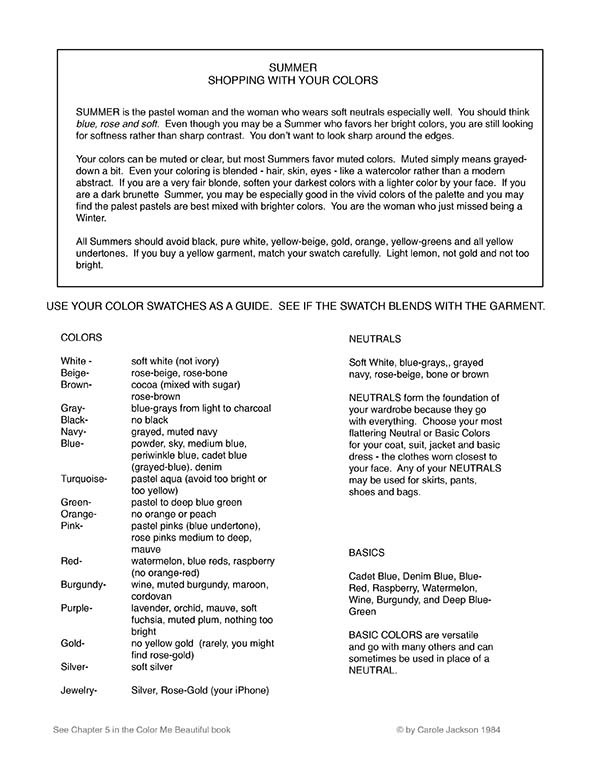 Alas, I can no longer offer fabric color swatches nor the wonderful brand-name makeup guide. 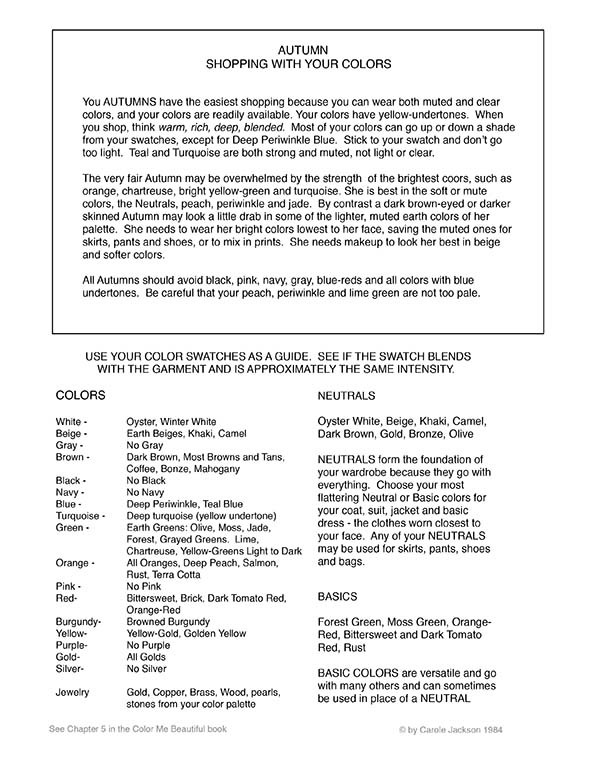 BUT, ON MY WEBSITE, I AM OFFERING PRINT YOUR OWN SWATCHES – as accurately as possible – with recommendations for appropriate paper. iBooks and Kindle Fire offer color in their electronic books. Kindle is only in black and white. If you print your colors, you can do well with Kindle even though you won’t be able to see the coloring of the models. 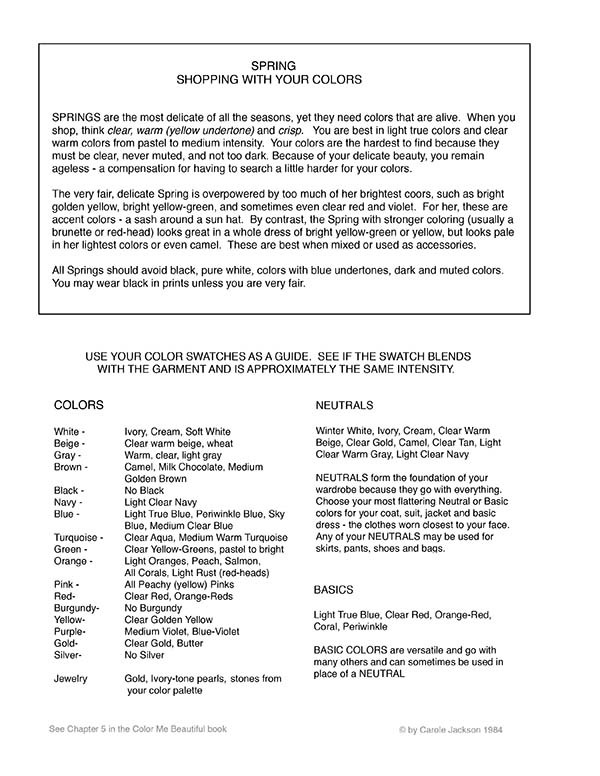 The information about color as well as the other topics in the book is valid. Figure analysis, clothing personality, eye glasses, hair color, wardrobe planning and more – are all VALID for today’s woman. The STYLE of clothing in the beautiful illustrations is outdated and will likely give you a chuckle. Some of the models’ makeup style is not today’s look – you won’t see lip gloss – but the application techniques are fine. The publisher insisted we call blush “rouge”, a term my granny used. No biggie. If you read the reviews, you’ll find that most are highly positive and find the information valuable and timeless. I’ll have to ask Ballantine Books (Random House) if they want to spend money reshooting all the models. I doubt it, but that would be fun! 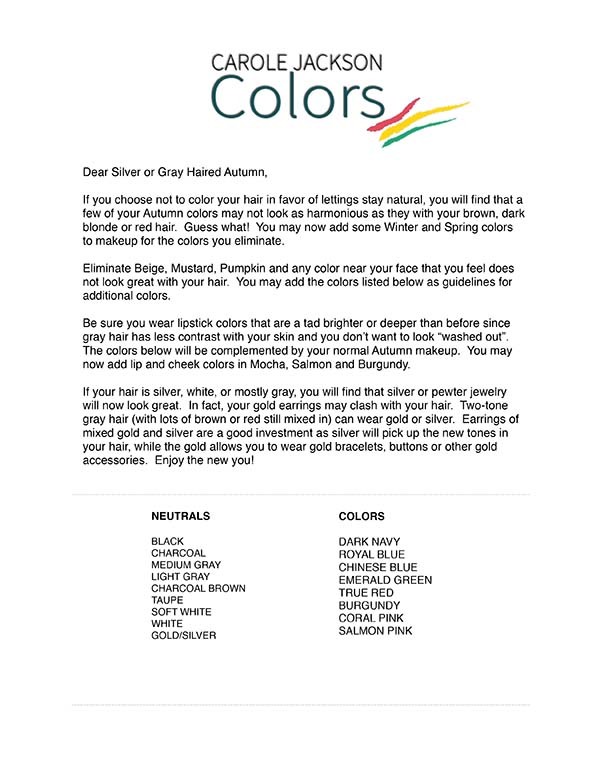 The younger generation often hasn’t heard of getting Personal Colors or of being an Autumn, Summer, Winter or Spring (unless their moms had their colors analyzed), but they might love it, too. Enjoy your colors, dear friends, in whatever form you receive them.